The lodge consists of the main building and surrounds, The Manor House and four comfortable Villas. The Manor House is built on a red sand dune, boasting a 360° view, within a 3000 hectare Private Nature Reserve on the fringes of the Namibian Kalahari. The main building consists of a large lounge and dining area surrounded by glass doors which open onto the outside deck to enjoy the magnificent views. The crystal clear infinity pool offers you the perfect spot to cool down on a warm summer’s day. In the adjacent kitchen, our Chef and her team lovingly prepare mouthwatering meals for our guests, using mainly locally sourced organic farm produce. The two original rooms, dating back to 1923, are now a cosy lounge with a variety of captivating books to browse through whilst enjoying a glass (or two) of fine South African or Namibian wine, and the other room is now the reception and stocks a small selection of locally sourced curios. 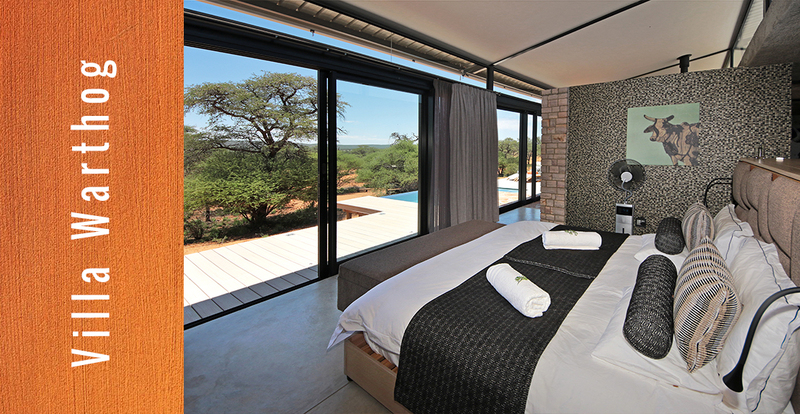 The east wing of the main building has a sauna and a small gym overlooking magnificent Kalahari scenery. This area can also be transformed into a conference facility or a magical venue for intimate weddings or special occasions. A platform for meals under a blue sky, a fire place to enjoy sundowners with Gin + Tonics and snacks around an open fire and the outside “boma” invitites for grill evenings under the stars, all form part of the main area. There are four carefully decorated Villas spaced far apart for absolute privacy. Each has its own lounge with fire place for those cold winter nights, and a beautiful bedroom with an en suite bathroom. 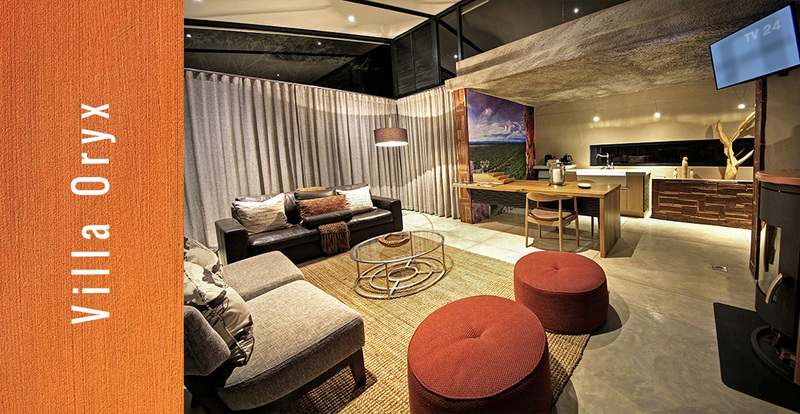 The lounge includes a kitchenette with a Nespresso coffee machine, a kettle and a fridge that is stocked with drinks according to the guests wishes. The Villas are surrounded by large glass doors to provide you with unrivalled views and close proximity to nature. Step outside onto a deck, ideal for sunbathing and enjoy the plunge pool to cool down on a sultry Namibian summer’s day or a relaxing Jacuzzi massage. Even when you shower or soak in your bathtub, nature is right next to you. Each villa has a “sala” with a lounger and hanging chair, perfect to unwind with a book, have an afternoon siesta or watch the rich wildlife around you. A romantic candle light dinner can be enjoyed on your deck or on the sala. Two villas are east facing to enjoy the magnificent sunrise and two are west facing to soak in Namibia’s spectacular sunsets. 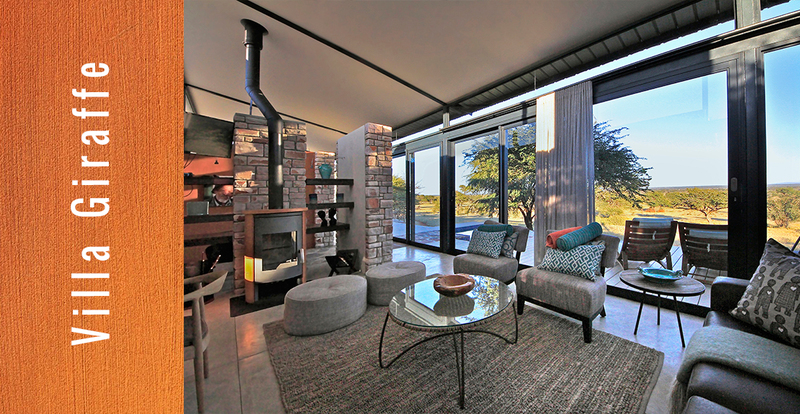 There is a waterhole on each side, which offer plenty of game viewing or bird watching from the comfort of your deck or the sala. This east facing Villa is beautifully decorated according to the theme of ‘Namibian Landscapes'. This is the second east facing Villa and was decorated with the eye catching theme of our local Nguni Cattle in mind. 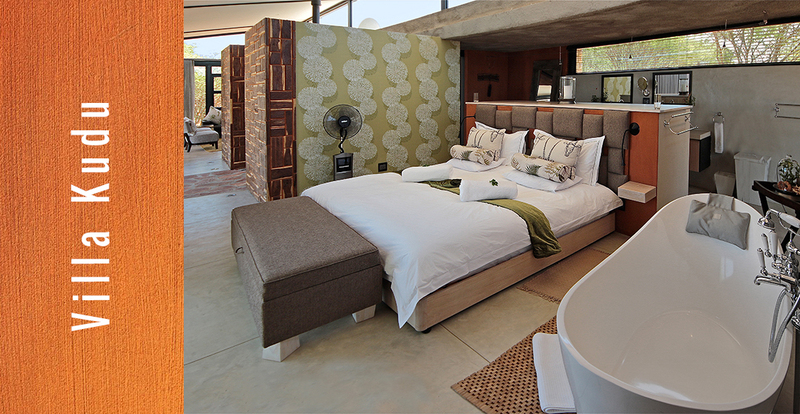 This is a west facing Villa and was lovingly decorated using Namibia’s abundant Fauna and Flora as inspiration. Our diverse and friendly Namibian People inspired the theme for this west facing Villa. This Villa is wheelchair accessible to cater for guests with limited mobility. It also has a sleeper coach for children sharing with their parents.